The 2012 United States presidential election in Connecticut took place on November 6, 2012, as part of the 2012 General Election in which all 50 states plus The District of Columbia participated. 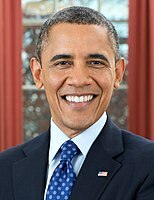 Connecticut voters chose seven electors to represent them in the Electoral College via a popular vote pitting incumbent Democratic President Barack Obama and his running mate, Vice President Joe Biden, against Republican challenger and former Massachusetts Governor Mitt Romney and his running mate, Congressman Paul Ryan. Obama and Biden carried Connecticut with 58.1% of the popular vote to Romney's and Ryan's 40.7%, thus winning the state's seven electoral votes. As Barack Obama was the only candidate to qualify, no Democratic primary was held. The 2012 Connecticut Republican presidential primary took place on April 24, 2012. It was a closed primary, open only to Republican electors. Twenty-five of the state's 28 delegates to the 2012 Republican National Convention were decided by the primary outcome, with the other three being superdelegates: the state party chairman and the state's two Republican National Committee representatives. Mitt Romney won the primary by a wide margin, garnering two-thirds of the vote. Only 14.4 percent of active registered Republicans participated in the primary, the lowest turnout since the primary format was put in place in the state in 1980. After switching from proportional distribution of delegates to a winner-take-all system in 1996, the Connecticut Republican Party voted in September 2011 to award delegates by a hybrid winner-take-all and proportional distribution process beginning with the 2012 primary. Of the 25 regular delegates at stake in the primary, the party called for three delegates to be awarded to the winner of each of the state's five congressional districts on a winner-take-all basis for a total of 15 delegates. The remaining 10 would be distributed proportionally based on the statewide vote total among candidates receiving at least 20 percent support unless a candidate won a majority of the statewide vote, in which case the candidate would receive all 10 of these delegates. With Romney's primary day wins in all five congressional districts and a majority of the statewide vote, he was able to claim all 25 of the delegates at stake. Official source reports a turnout of 59,639, with the difference from 59,578 likely due to blank ballots. ^ "Connecticut Statement of Vote". CT SoS. Retrieved 19 January 2013. ^ "Merrill: No Democratic Presidential Preference Primary in Connecticut, Only Four Candidates for Republican Ballot on April 24th" (PDF). Secretary of the State of Connecticut. March 5, 2012. Retrieved October 21, 2012. ^ "Merrill Releases Turnout Figure From 2012 Presidential Preference Primary, Romney Wins All 25 Delegates at Stake" (PDF). Connecticut Secretary of the State. April 25, 2012. Retrieved May 2, 2012. ^ a b Vigdor, Neil (September 28, 2011). "State GOP moves away from winner-take-all presidential primary". GreenwichTime.com. Retrieved April 26, 2012. ^ "Connecticut Republican State Central Committee Rules and Bylaws" (PDF). September 27, 2011. Section 17. Retrieved April 19, 2012. ^ "Connecticut Republican Presidential Primary" (PDF). Secretary of the State of Connecticut. Archived from the original (PDF) on September 29, 2012. Retrieved May 9, 2012.